Polk State Nursing and Healthcare Administration students prepare to board canoes that will transport them to Panama's indigenous Embera tribe. 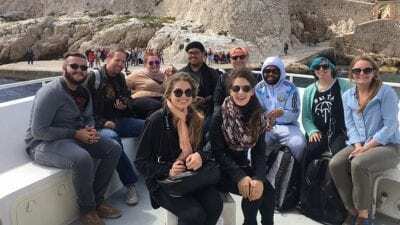 While the Bachelor of Applied Science in Supervision and Management students, rested from the previous day’s adventure on the Panama Canal, headed for a tour of Panama City, another group of students left civilization behind. Traveling under the direction of Healthcare Administration Professor Dale Anderson and Nursing Professor Lorrie Jones are six students pursuing either their Bachelor of Applied Science in Supervision and Management with a specialization in Healthcare Administration or Bachelor of Science in Nursing degrees. This group of travelers has so far visited schools, clinics and hospitals in Panama, all the while comparing and contrasting the American and Panamanian healthcare systems. The differences have been striking, particularly in the area of prevention. Here, the students and professors agree, there is more of an emphasis on preventing illnesses and promoting wellness, whereas in America healthcare is largely concerned with after-the-fact treatment. But the idea behind this trip is not just to expand students’ understanding of healthcare systems, but also of the people those systems treat. Hence Sunday’s day trip to the jungle to experience the culture of the indigenous Embera tribe. In Panama’s Darien Province, just 40 minutes or so from the hustle and bustle of industrialization, the Emberas persist as they have for centuries in their simple, natural, nonmaterial way of life. They sleep in thatch-roofed huts. They wear handmade beaded clothing. They fish and weave baskets. What they know of commerce is limited to the selling of necklaces, masks and trinkets to tourists. The Embera culture is unlike anything the Polk State students have ever experienced before — and that is precisely the point. But in healthcare, day to day, even moment to moment, these students will encounter individuals from cultures, education levels and economic means vastly different than their own. The better equipped they are to bridge those differences, the more effective they will be in the field. Going to Embera, the professors hoped, would rouse their students from their comfort zones. “It’s about teaching empathy for people who may not be as clean or smooth or good smelling as you,” Snow said. The day’s journey began at 7:30 a.m., with a van ride to Chagras National Park, a 300,000-acre reserve created to protect the rainforest as well as rivers that provide water for the Panama Canal. This is where the Emberas make their home. From the van, the students climbed into canoes that carried them a mile down the Chagras River. During the rainy season, the river runs deep; the students’ tour guide for the day pointed out the dark line high on a rock that marks the rainy-season depth. But with the rain still months away, the students’ canoes ran aground several times. A handful of the travelers exited the vessels to push, pull, or just to alleviate the load. After much teamwork and laughter, however, the group arrived at a nondescript stretch of sandy shore, and began a half-mile hike to a waterfall. The terrain, while easily passable, did present a few challenges in spots. While crossing a stream, BSN student Nicole Richard stumbled, but her classmate Amanda Smith was ready to assist. Each of the nursing students was more than prepared for their excursion, carrying backpacks filled with disinfectants and antibiotics. Smith got right to work, sanitizing Richard’s injury and administering Motrin. A half-hour or so after they set out, the group arrived at the waterfall where, warm from their trek, they waded and dog-paddled. The bravest made it all the way to the base of the waterfall, letting the stream soak their heads. From the waterfall, it was back to the canoes and back to the Embera village, where natives, adorned in beads and Hibiscus headbands, waited to greet their visitors. The villagers led the Polk State contingent through their small community to an open-air, thatch-roofed hut. There, the day’s tour guide, Juan, translated as the village chief described his people’s culture and customs. Behind the chief, women of the village prepared the day’s lunch: large trays of banana, pineapple and cantaloupe, and tilapia and plantains cooked over a wood fire and served in leaves folded to resemble waffle ice cream cones. Their lunch eaten, some of the Polk State travelers wandered to the village bathrooms, where they marveled at the Embera way of life. Families sleep in sparse huts and dry threadbare linens from clotheslines. A trio of children told secrets and played jacks under the overhang of the cabin that houses the restrooms. Earlier, as their canoes had turned toward the village, the travelers had laughed as a small child slid down a mud slick, covered head to toe in dirt but beaming with pleasure. Back home, those sorts of smiles are evoked by trips to theme parks and expensive video games. 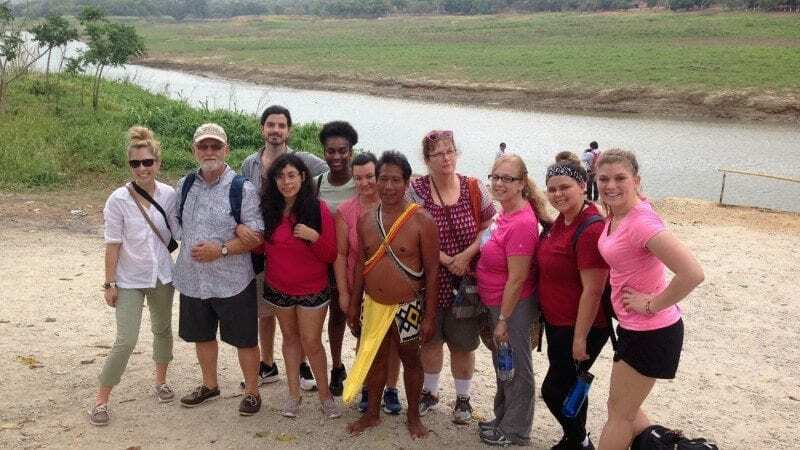 Some of the members of the Polk State contingent couldn’t help but think about how carefully they had selected their clothing for the Embera trip — would their shoes be sturdy enough, which shirt would offer the best mosquito protection. Yet, the Emberas, shoeless and with a wardrobe limited to what they can make by hand, seemed perfectly content, even carefree. Before leaving the village, the Polk State travelers took time to shop the village handicraft, including necklaces, bracelets, masks, and baskets, but also to bestow gifts of their own. The students handed out what American children would describe as party favors — tiny kaleidoscopes, small plastic animals, and the like. The Embera children accepted them gratefully, smiles stretching across their faces, but also with a refreshingly naïve curiosity. One small child ran to his mother, curious what to do with a kaleidoscope. She didn’t know either. Nursing student Mona McDowell mimed what to do — hold it to the light and turn. The mother followed suit before handing the toy, a tiny treasure from a foreign land, back to her young son. On the canoe ride back to their van, a fine mist cooling the students’ faces, there was a feeling that something incredibly special had just occurred. These students might otherwise have been spending their Spring Break at the beach or on the couch. Instead, they had spent it having a truly once-in-a-lifetime-experience. They had learned about a culture few even know exist. They had sampled its cuisine, witnessed its songs and dances, communicated as best as they could with its people, and in the process, something had changed within them all. The goal Anderson and Jones had set for the trip — to instill empathy and cultural awareness in the students — had been reached.